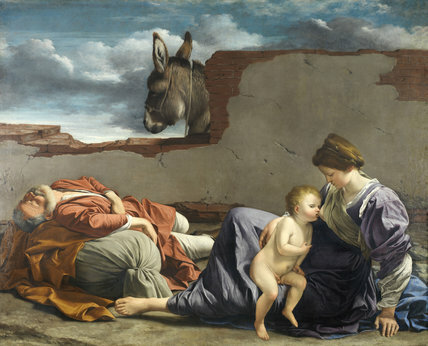 Gentileschi has treated the subject as if the Holy Family were ordinary Italian peasants. Joseph is old, haggard and exhausted. The Virgin is a young, well-built woman with grubby feet sitting uncomfortably on the floor of a ruined building as she feeds her toddler child. Jesus appears naked and vulnerable glancing furtively towards the viewer and we are reminded that this family are refugees escaping from Herod's death-threat.